Last week on American Idol (one of my favorite TV shows) a contestant, Meagan Joy, was wearing a very attractive chunky necklace. While she is not my favorite performer, her Flintstone-style necklace really caught my eye. This week while watching the show again, I decided to create a similar necklace. I completed the necklace within the hour and a half length of the show. 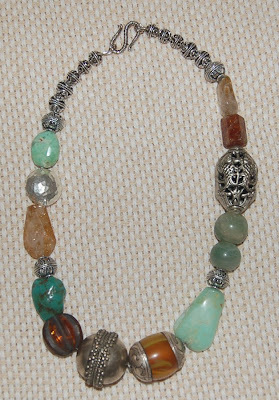 I actually took more time choosing the gemstones and silver beads for the necklace than the construction. Of course I couldn't find the exact beads that the contestant had on her necklace, but I think my combination of beads looks really good. Included in the piece are citrine (faceted yellow-brown, chrysophrase (mint green), hessonite (reddish-brown faceted), rutilated quartz (clear with golden needles) and turquoise. The other beads were purchased a long time ago so I don't remember what they are made of (maybe I never knew). Look all around you for art (TV, magazines, nature, etc.) and borrow some inspiration from it. Have you seen the Beadalon components to make chains.......assorted ring shapes and connectors? They come in many shapes and sizes in both silver and gold plated. In the weeks to come I will be posting jewelry I've created with this new product. It's so easy to put together jewelry because basically you just need pliers to attached the rings together with the connectors. 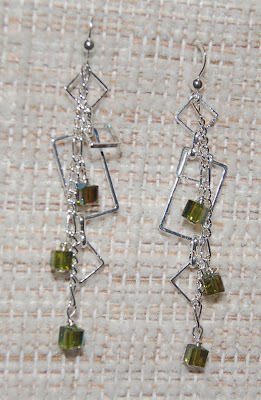 The earrings pictured here required only six small square rings, two rectangles, four medium connectors, six crystal cubes, six headpins, two pieces of chain and two earwires. If I have a chance I'll write up this simple project or perhaps make kits. Do you need a quick edible Easter treat? Try this recipe. 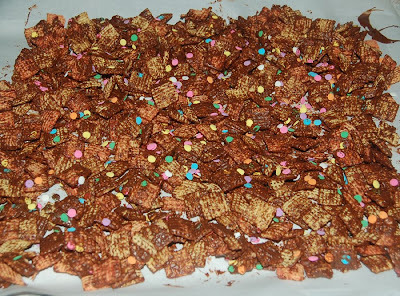 Combine one box of Strawberry Chex Cereal with one bag of melted Guittard Chocolate Melt 'n Mold candy. I put the cereal on two parchment lined cookie sheets and mixed it with the chocolate that was melted in the microwave oven. You could fill a pastry bag or ziploc (cut off a corner) with the melted chocolate and squiggle it over the cereal if you wanted to be neater. Lastly, I decorated the mixture with colorful candy dot sprinkles (available now at Ben Franklin Crafts). Once the coated cereal is cool, package it in Easter cellophane bags and tie it with ribbon or fill decorative Easter storage containers (the ones with handles are really cute and they're reusable). This treat can be combined with popcorn if you like the salty sweet kind of snacks. This project was supposed to be posted on the craft website this week but like the winning bag photos there will be a delay. For that reason I've decided to show you the project here and perhaps I can get some help posting the project directions too. 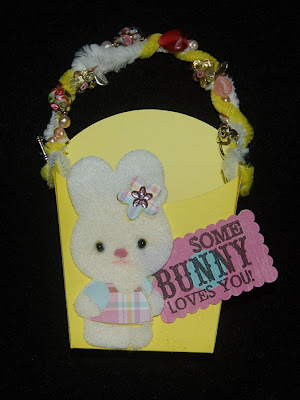 I think this Easter project turned out well and would be a sweet way to give someone an Easter basket where the gift (the bracelet) is part of the basket. For a little girl you could make the bracelet from inexpensive plastic beads. A gemstone bracelet would make a spectacular handle for your mom's Easter basket. The inspiration for this project started from the cover picture on the Sizzix French Fry die cutter. In the picture the French Fry box had a beaded handle which would be a great way to present a small gift to a beader. Taking it a step further this project incorporates a completed bracelet into the handle. The Hello Kitty friend, ‘Kathy’ bunny die cutter was used on white felt to add a warm fuzzy texture to this project. 1) Die cut the box from the cardstock and tape it together. 2) Die cut the bunny from the felt (remove the eyes and nose) and glue it to the box. 3) Die cut the dress and flower from the plaid paper and glue them onto the felt. 4) Die cut the sleeves from the blue paper and glue them onto the bunny. 5) Glue the seed beads into the eye holes. 6) Make a small nose from the pink wool or cut a small piece of felt and glue it in place. 7) Glue the rhinestone to the flower. 8) Cut out the rectangle from scrap paper and stamp it with the words. 9) Glue the tag to the side of the bunny. 10) Punch holes in the box for the handle. 11) Wrap one pipe cleaner around the bracelet to attach it to the other pipe cleaner. 12) Insert the handle ends into the box holes and cut the excess if necessary. Tip: Besides candy you can fill the box with one giant decorated cookie, an assortment of beads, small handmade note cards, or paper crafting embellishments. This bracelet was designed for the Bunny Treat Basket project, but it is fashionable enough to give as a gift for any occasion. You may not be able to find the exact beads but it will be easy to purchase similar ones. Although this bracelet is low in cost, it would make a delightful Mother’s day gift especially if it is crafted by the mother or grandmother’s child. 2) Two crimp beads to fit the wire. 1) Pass one end of the wire through one crimp bead, ¼” of French wire, the hole in the clasp and then back through the crimp bead. 2) Use the crimping tool to squash the crimp bead. 3) String the beads and caps onto the wire (consult the photo for order) covering the excess wire. 4) When the bracelet reaches the length you want (7 to 7-1/2” is average) string on the crimp bead and French wire cover, then go through the clasp toggle. 5) Pass the wire back through the crimp bead and some of the beads. 6) Pull the wire and then crimp the bead and cut off the excess wire. 2) The crimp bead size has to match the wire diameter or it will slip. (The crimp bead size needed is usually on the beading wire spool. 3) String smaller beads near the toggle end of the clasp so that they will fit through the clasp. I was going to have photos of the winning bag entries posted on the BFC website, but our website manager is out for the week. For interested readers I decided to post the photos on my blog and later post them on the craft site. As you can see the bags were really clever and beautiful. The first place fern bag was created by Mary Carvalho, the 2nd place wrap-around ocean scenery bag is the art work of Patricia Kaula, and Valerie Bergstedt's flower bag and owl bag won her third place. Congrats again to all three crafters! When playing with my new 'toys' I discovered that some of the Martha Stewart punches also emboss. The owl punch is really cute because the rings around the eyes are embossed when you punch out the owl. The floral edge punch that embosses flowers as the edge is cut makes a very professional card from a plain card blank. I didn't like the shape of the MS punches at first because they are a bit unbalanced, but now I realize that the square shape actually makes them easy to arrange upright on a shelf. I'm anxiously waiting for more cupcake punches to arrive at BFC because they were gone by the time I got to the store. If you want to stay on your diet, choose your doughnuts from the non-edible variety. Ben Franklin Crafts has a mouthwatering selection of gemstone doughnuts for you to incorporate into your jewelry designs. Pictured here is a necklace that is quickly whipped up from a green gemstone doughnut, cording, a few beads and a metal pendant from Mountain Idea. The closure for the necklace is made from adjustable sliding knots, but you could use a cord fastener with a loop for a clasp and attach a chain to make it adjustable. 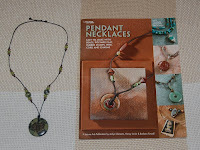 The Leisure Arts booklet (from BFC) in the photo has many good designs for easy gemstone pendants with an ethnic look. Thank you Anonymous for your comment. You are right we should apologize for our mistake and we are sending Joan a small gift in the mail. If you know Joan, we are sorry that you were so upset with our blunder. We tried to correct our error as quickly as we discovered it and we assumed that Joan would realize that the description of the 3rd place bag did not match her bag. This is the first online contest we have done and it is difficult to keep all the printouts separate, hence the mistake. Previous contests required that projects be mailed to us which was costly for the contestant but did make it easier to keep the projects with the correct names of the creators. If we ever have another online contest we will check and double check the results before announcing them. The photos of the winning bags should be on the website next week and the prizes will be mailed out next week as well. Sorry this post was published earlier but we discovered a mistake in our records. Originally the decision was made to have two third place winners because there were two bags that were equally good. There was a reason for that because they were both made by Valerie and we're sorry but Joan your name was accidentally attached to Valerie's photo. Okay, so here are the real winners...... finally. The first place and a Ben Franklin Crafts gift card for $100 goes to Mary Carvalho! 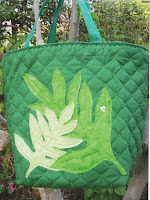 Congratulations Mary, your quilted fern leaf bag is fantastic! Second place and a gift card for $50 is awarded to Patricia Kaula for her cleverly appliqued ocean scenery bag. Valerie Bergstedt will receive a $25 gift card for her creative efforts. 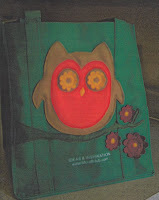 Valerie's graphically stunning owl design bag and eye-popping flower bag both made her a winner. Congratulations to our winners and we appreciate all the efforts of the crafters who took the time to enter our contest. We hope that you had fun making your creations and will proudly use your original, handcrafted bags when shopping at Ben Franklin Crafts. We will post pictures of the winning bags as soon as possible. Did you enjoy shopping with your 40% off coupon this weekend? What did you buy? Of course I bought more than the one coupon item. I found wonderful Beadalon silver and gold plated links in a variety of shapes along with packages of connectors to turn those links into fashionable jewelry. I'll make projects for the website with these items as soon as I finish the Easter goodie mini-basket. I also found some new gemstone pendants by Imagine It. The labodorite (with blue and gold flashes) large teardrop bead is spectacular and I can't wait to create something with it. In thirty minutes the Craft Green and Win Green contest will end and tomorrow I will announce the winners of the gift certificates. 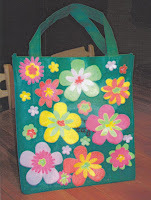 I hope that you took the time to enter and will check back to this blog or our craft club website to see if you won. For our first online contest we were pleased with the quality of the entries and surprised that most of the contestants entered photos of their work digitally. It truly is becoming a computerized world and we are proud that our company is making an effort to keep up with the changes. Whenever I get new rubber stamps I can't wait to try them out. A recent purchase of two Hero Arts clear sets (Asian Frames and Japanese Dolls) inspired me to make this birthday card for my niece. Hero Arts also has a set of a smaller version of the four Japanese dolls on wood mounts, but the other stamps in the clear set are useful. To make this card I started with a blank white card and used the Martha Stewart daisy edge punch to decorate the front flap. Next, I stamped the back of a piece of colorful origami paper (thin ones work best) using light colored ink and one of the doll stamps. The kimono part of the stamped design was cut out and run through a Xyron (print side up). You could use a glue stick if you don't have a Xyron machine. Stick the kimono onto the card and carefully stamp (using black ink) the doll design over the cut out kimono. Cut out a 1" strip (long enough to go all the way across the card) of the same origami paper. Stamp the strip with the cherry blossom border stamp if desired and glue or tape the strip inside the card so that part of it shows below the punched edge. With dark green ink, stamp the bamboo design three times on the card (masking the doll to protect it). Color the bamboo with green, yellow, and brown color pencils and shade in shadows for the doll and bamboo. Lastly, stamp a birthday message in black ink. The wish stamp came from a Hero Arts clear set, but you could use whatever appropriate stamped message you need. I hope that you will try to make this card. (Click on the photo to see a closeup of the card.) It is a good way to use up origami scraps and making a greeting card set using the four dolls would be a great gift or craft fair item. 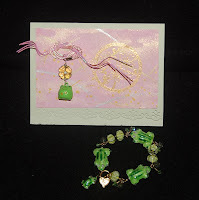 On Sunday I bought a package of acrylic four-leaf clover beads from Hilo Ben Franklin Crafts. At the time I didn't know what I would do with them but the display of St. Patrick's Day green beads at the store was so eye-catching and irresistible that I had to have the clover beads. I also bought a green frog Japanese bell and a package of pink cell phone straps. ( In Japan the frogs say "kaeru, kaeru".) Somehow I decided that the clover bead and the frog bell should go together, perhaps because they are both symbols of good luck to two different cultures. With 22 gauge wire I wire wrapped a clover bead to the phone strap jump ring and the bell. The phone strap (or purse pull) was cute and I thought that it would be a good add-on to a card for someone going to Vegas. (Giving someone 'lucky' money for a trip is a Japanese custom.) The card in the photo (click on it to enlarge) started from a blank green card whose front was trimmed with a Martha Stewart daisy edge punch. Next, I cut a piece of pink washi paper from a 12 x12 sheet that had some silver and gold designs on it. It might be attractive to tear the washi paper instead of cutting it. I stamped the round cherry blossom design from the Hero Arts Clear Stamps Asian frames set onto the washi paper. (I used gold Brilliance ink and gold embossing powder.) I cut a single strand of pink Mizuhiki cord into four pieces and slipped them through the jump ring of the phone strap. Then I tied a loose knot with the Mizuhiki and the strap. After crinkling the Mizuhiki into a design I attached a glue dot to the back of the knot and placed it on the card. I've hoarded a pretty faceted prehnite 7" gemstone strand from Ben Franklin Crafts for several months just waiting for an inspiration. Oddly, the inspiration finally came from a sage green washcloth. The little rabbit on the cloth was holding a green clover with the word 'lucky' on it. Since I don't have a green bracelet and I wanted to make one for St. Patrick's Day, I came up with this project. 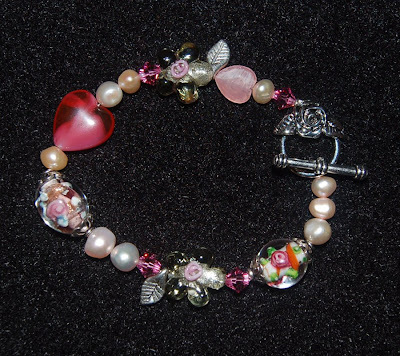 I posted the instructions for this bracelet on the craft club website. I've ordered a four-leaf clover sterling charm to attach to the bracelet, but it hasn't arrived yet. If you decide to make this bracelet but cannot find the same beads, just pick a variety (different sizes, shades, and amounts) of green faceted gemstone beads. You can also form a sterling silver name or word other than 'lucky'. Now, onward to Vegas to test the lucky green power of this bracelet! I've always felt that I am a lucky person. Perhaps that is why I love searching antique stores to see what lucky finds appear for me. A few days ago a drive to Honokaa and Waimea meant stopping at two favorite antique shops. Pictured here are a few of the pretty things I purchased. The glass footed dish was only $12 and a great example of elegant glassware from the Depression Era (not a predictor of times to come, I hope). I can't identify the etched flowers but they are beautiful and look like orchids or daffodils. I know that this piece will be sensational at a holiday dinner, maybe Easter. The three gold pieces were also lucky finds. The two lockets are probably from the 1920's or 30's. The heart locket is a n ice rosey color and will someday be used on a necklace I plan to make to feature my collection of heart lockets. The round locket amazingly turned out to be 10kt gold and I know that I would normally pay 2 or 3 times what I did. It should make a good charm for a bracelet or necklace. You might wonder why I would buy just one earring. Well, it was priced reasonably and I'm certain that it is a Victorian rose gold piece from the late 1800's. The craftmanship on the earring is superb and I think that it can be fashioned into a focal point of a 'Y' chain necklace. 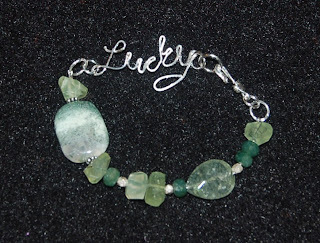 In my next blog entry I will show you my 'lucky' bracelet that I designed for a March St. Patrick's Day project. Remember: "It's great to be lucky, but hard work always makes you luckier."